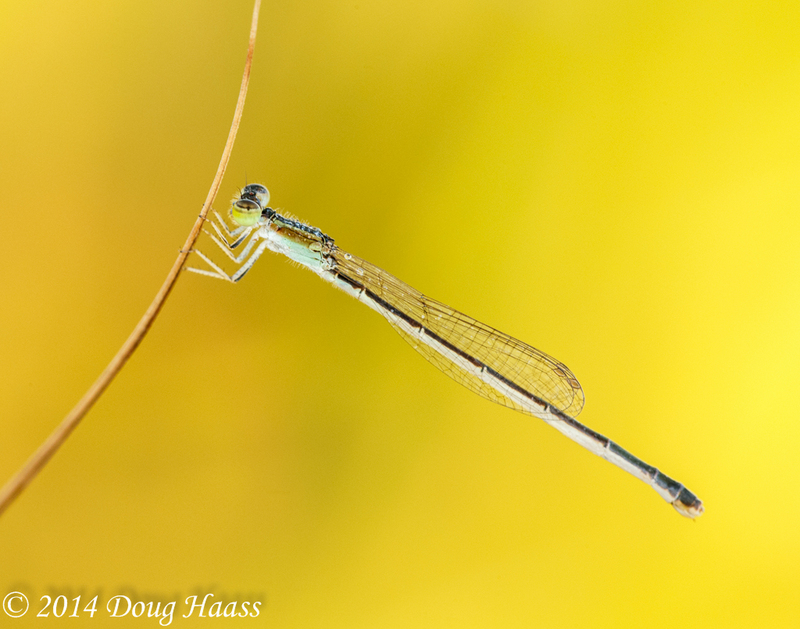 The Fragile Forktail Damselfly Ischnura posita is one of the smallest damselflies, measuring about 1 inch long. The only thing that helps to locate them hiding in the grasses, are the big colorful eyes, and the colorful markings on their thorax. It is difficult to tell from this angle, but Fragile Forktails are identified by having two distinguishing exclamation marks on their thorax. They are most active spring through early fall. In order to spot them you have to stop, crouch down low, and slowly scan a small area in front of you. I can usually only spot one peripherally (from the corners of my eyes) as it slowly hovers back and forth, low to the ground. Damselflies differ from most dragonflies in size, and by the fact that their wings are usually (not always) folded back onto their body when at rest. They eat mosquitoes and flies, but will eat most anything they can catch. At sunrise one morning, I spotted this one hovering as I slowly scanned the grasses in front of me. Fortunately for me, it landed on a small twig with a great colored background.